The daughter of singer Eddie Fisher and actress Debbie Reynolds in 1956, Carrie Fisher spent her life in the limelight of her fame. 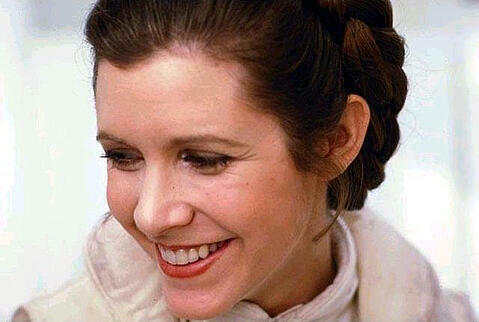 The world-famous actress premiered in her first film Shampoo with Warren Beaty and Goldie Hawn, and was best known for her iconic role as Princess Leia in the original Star Wars trilogy. But her true talents were shown through her skills as a writer. Much of Fisher’s writings revolved around mental health advocacy, particularly her own bipolar disorder. Her 1987 book Postcards from the Edge revolved around her struggles with drug addiction, and her one-woman script Wishful Drinking in 2008 was a narrative of facing the public shame and social stigma of addiction. Besides her public challenges with her mental challenges, her life of drugs and alcohol led to the hardening of her arteries, one cause cited toward her death. After traveling abroad in December of 2016, Fisher suffered from cardiac arrest. After a few days in the hospital, Fisher did not wake from her sleep and was declared dead on the 27th at the Ronald Reagan UCLA Medical Center. The Associated Press cited that fatty tissues built up around her arteries, drug use and sleep apnea are factors that contributed to her death. What’s OSA Got to Do with It? So with so many different factors contributing to her death, how was it that sleep apnea was the final straw? Sleep apnea is a condition that causes interruptions in a sleeper’s breathing during the night. 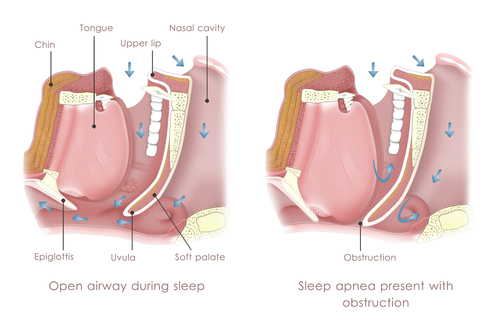 The leading type of sleep apnea is obstructive sleep apnea (OSA). OSA involves blockage of the upper respiratory airways caused by a collapse in throat muscles, the tongue falling back into the airway, or enlarged tonsils or adenoid obstruct airflow. While sleep apnea is not always coupled with heart disease, a connection between the two is not uncommon. During the night, blood oxygen levels drop during a pause in breathing, causing the brain to send a signal to constrict vessels in order to increase oxygen flow. This can lead to an increased blood pressure level during wake hours for those experiencing sleep apnea. In fact, the correlation between high blood pressure and sleep apnea is so close, that those being treated for high blood pressure are often questioned whether they experience sleep apnea. What Is High Blood Pressure, or Hypertension? High blood pressure, also known as HBP or hypertension, is defined as a condition when the force of blood pushing against the walls of the vessel is consistently too high. 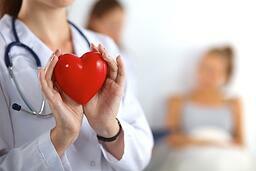 It is also a leading contributor to heart disease, strokes, and heart attacks. The American Heart Association cites the cause of this is due to the “excess strain and resulting damage from high blood pressure causes the coronary arteries serving the heart to slowly become narrowed from a buildup of fat, cholesterol and other substances that together are called plaque. This slow process is known as atherosclerosis. Unfortunately, Carrie Fisher is not the only victim of a sleep apnea-related death. According to UW Health, a study conducted over 18 years found that those with untreated sleep apnea resulted in three times more deaths than those with non-sleep apnea. The good news, however, is that the rate is not as high as other diseases, and can be prevented with the right care. According to this same study, those who “had used continuous positive air pressure therapy (CPAP) for their sleep apnea fared better.” In other words, those who chose treatment for severe sleep apnea drastically reduced the chances of developing heart disease and thus reducing the odds of a sleep apnea-related death. If you have been diagnosed with sleep apnea, be sure to keep track of your blood pressure readings in order to catch a rise early on. You can buy a monitor at any drug store starting at $20, with Omron recommended by doctors as the most accurate on the higher price range. Normal range is a systolic number (the top number that measures amount of pressure in arteries during contraction) under 120 and a diastolic number (bottom number that measures how much pressure is exerted against arteries while resting beating beats) below 80. Pre-hypertension begins at 120-139 over 80-89, while stage one of hypertension begins at 140-159 over 90-99 and stage two at 160 or higher over 100 or higher. If you are noticing a rise in blood pressure, be sure to visit your primary physician who can recommend additional treatment. Whatever the recommendation, a well-rounded diet and daily exercise are sure to be one prescription, along with a change in habits if you drink and/or smoke. The DASH (Diet Approach to Stop Hypertension) diet is designed to tackle hypertension specifically. But with its balanced recommendation of fruits and veggies, whole wheat, lean meat, and low-fat dairy, it can still be easily adopted by non-hypertension users. If you’re not sure whether you have sleep apnea, you can always take our quick quiz and find out. If you have been recently diagnosed or suspect you may have sleep apnea, then be sure to visit a specialist right away to discuss treatment. Our specialist here at Alaska Sleep Clinic are experienced in treating sleep apnea, and are sure to help you decide the best treatment. If you live in the Anchorage area, then be sure to give our specialists a call for a free 10-minute consultation.